Martin Luther King once said: “Occasionally in life there are those moments of unutterable fulfillment which cannot be completely explained by those symbols called words.” There comes a time in a hockey player’s life when he looks back at his career and realizes that he shares a special bound with some of his former teammates, more than with the others. It’s bond that needs no words, one that is expressed by a look, by a feeling, even when separated by distance, time or life. Allow me to take you back. The year… 1985. The Sherbrooke Canadiens, captained by Brian Skrudland, had just finished their season with 79 points, good for third place in North division. While scoring goals wasn’t necessarily a problem for the baby Habs having scored 323 goals that year, keeping the puck out of their own net was a different story. The team had allowed 329 goals against, worst among the playoff bound teams. Adding an offensive weapon like Richer was a no-brainer for Creamer, but Roy was far from a sure thing. The team’s number one goaltender, Greg Moffett, was average at best, finishing the season with a 4.11 GAA and an .860 save percentage. The Canadiens had dressed five goalies throughout the season, but adding a rookie selected in the third round of the 1984 NHL Entry Draft and coming off a pretty bad season didn’t seem to be the solution either. To this day, I don’t know if it was Creamer’s decision or if the idea of using the young goaltender was pushed upon him by the Habs’ brass, but Roy was given the net and we know the rest of the story. The Calder Cup Finals ended on May 24, 1985 with the Sherbrooke Canadiens defeating the Baltimore Skipjacks four games to two to win the Calder Cup. Living in Sherbrooke at the time, a friend of mine and I bought tickets for that game and what a game it was! To this day, I remember Stéphane Richer rushing down the right wing only to let go of a bullet from just outside the faceoff circle, missing the net as the puck came all the way back into the Canadiens’ territory. He came back into his zone, took a pass and flew back down the same side with blazing speed. The defenseman, fearing to be beat by his speed (and his shot), backed up with him but this time, Richer put on the brakes before releasing a bullet, beating the Skipjacks’ goaltender. I knew then that Richer was the real deal and that he would one day play in the NHL. It was so great to see team captain Brian Skrudland, a blue-collar worker in the true sense, winning the Jack A. Butterfield Trophy as AHL playoff MVP, then raising the Calder Cup over his head, skating around the rink with the rest of the team. Richer wasn’t bad either in those playoffs, managing to score nine points in nine games, including six goals, while the young Patrick Roy, then wearing number 30, was making the key saves when the team needed it most. Sherbrooke had previously defeated Fredericton (4-2) and Maine (4-1) before facing Baltimore in the finals and they were underdogs in every series that year. It is interesting to note that two-times Habs’ head coach Michel Therrien was also a member of that Calder Cup winning team. The following season, eight players who were part of the 1985 Sherbrooke Canadiens Calder Cup winning roster ended up playing for Jean Perron and the Montreal Canadiens at the NHL level. Brian Skrudland quickly made his niche as a reliable defensive center, learning from master veteran Guy Carbonneau and adding depth to the second unit of penalty kill. Gaston Gingras brought his best weapon, a powerful shot from the point on the powerplay, while fellow defenseman Mike Lalor was as steady as it gets at the blue line, a stay-at-home defenseman able to take care of his own end and making a nice first pass. Stéphane Richer and Serge Boisvert brought some offensive threat and tons of speed to Perron’s line-up while tough guy John Kordic came in to support veteran Chris Nilan in ensuring that the other teams wouldn’t cross the line. Mario Tremblay, seeing Kordic for the first time in the dressing room, once said that he was built like a brick wall, a very imposing figure. 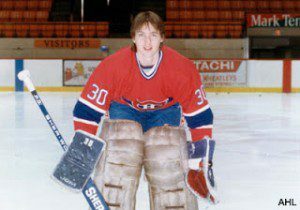 A certain Patrick Roy also made the jump from the junior ranks straight to the NHL, appearing in 47 games that season, sharing the workload with veterans Steve Penney and Doug Soetaert. Any guess on who the eighth player from the 1985 Calder Cup winning team to play for Perron was that year? It’s none other than forward Randy Bucyk, who took part of 17 regular season games and appeared in two playoffs’ games in 1986. Sure, this 1985-86 Habs’ team had its ups and downs during the regular season, as any team adding so many rookies should be expected to. Still, the Habs managed to finish the season with 87 points, good for second in the Adams Division, five points behind the Quebec Nordiques and a single point ahead of the Boston Bruins. The youth and the winning experience from those rookies added some much needed enthusiasm, a fresh desire to conquer to this championship team. Many of them had some impact on the storied franchise’s 23rd Stanley Cup, none bigger than Roy who received the first of his three career Conn Smythe trophies as playoffs’ most valuable player, two of which he won wearing the CH on his chest. Roy, Richer, Skrudland, Gingras, Boisvert, Lalor, Bucyk and the late John Kordic share a very special bond: winning consecutive titles in two different leagues, including one as a rookie in the NHL. Will we witness that again someday in Montreal? Only time will tell. Go Habs Go!